Life on Nanchang Lu: Oliebollen: They Sound Good, They Taste Good! 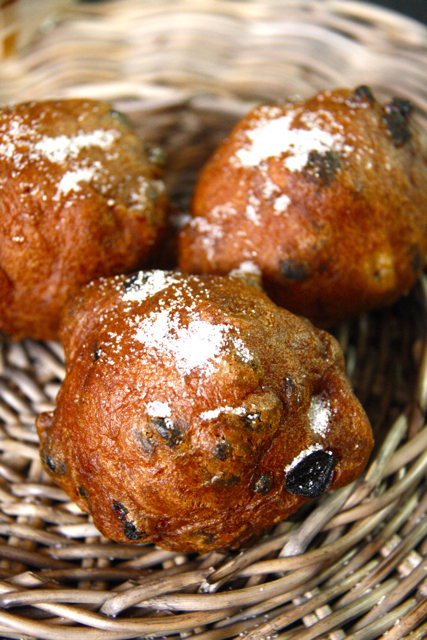 Oliebollen: They Sound Good, They Taste Good! 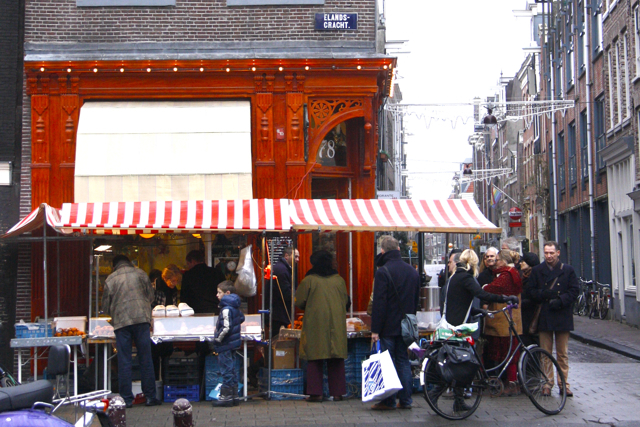 Oliebollen are everywhere I go in Amsterdam - in every corner store and supermarket I can't avoid the signs advertising their Oliebollen specials, and outside every bakery is a makeshift stall selling Oliebollen, usually with a long queue of hungry people waitng for the next batch. What are these oliebollen? They're a delicious special Dutch food eaten on New Year's Eve, with the most fantastical story attached to their history. I love a bit of food with history, especially when it tastes as good as these little fellows. Oliebollen (say it over and over, it just rolls off the tongue doesn't it? Which would explain why, so far, it's the only Dutch word I can say convincingly) are translated literally as 'oil balls', but don't let that put you off. 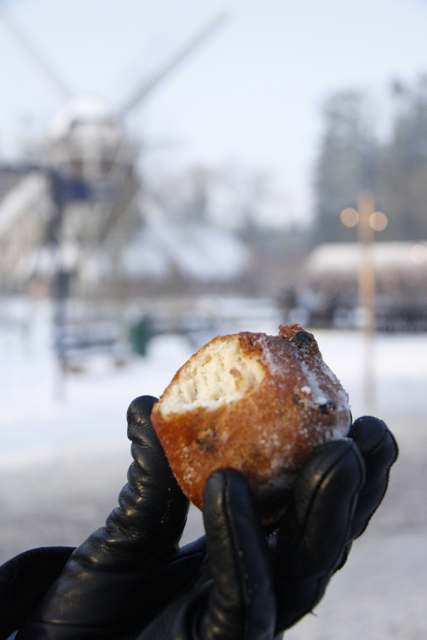 They are Dutch donut balls, thickly crispy outside, and with a yeasty sultana-filled dough on the inside, sometimes with added apple pieces, deep-fried then dusted with icing sugar. They should be a Dutch national treasure of deliciousness. Ideally eaten when hot and steaming, on a really cold winter's day. So the story behind them goes that during Yule (December 26 to January 6) the pagan goddess Perchta would fly through the dark mid-winter sky accompanied by evil spirits, looking for offerings of dumplings and herrings. Perchta has two incarnations, the beautiful and pale-skinned goddess bringing light to the winter darkness, and her alter ego, the evil and pernicious hag. Those who didn't please her would have their bellies cut open and stuffed with straw and pebbles. If they had eaten oliebollen though, the oiliness would cause the sword to simply slide off their bellies, saving them from certain death. Cool, huh? Hoping to avoid this fate, I've been eating as many oliebollen as possible. This one is piping hot, and it's minus five degrees outside so the gloves are staying ON. And yes, that is a blurry windmill in the background. adapted from www.allrecipes.com, original here. Dissolve yeast and sugar in warm milk, let stand for a few minutes. Sift flour and salt into a large bowl. Stir in the yeast mixed with milk and sugar, and the egg, to form a smooth batter. Add the currants, raisins and apple pieces to the batter. Using two metal spoons, shape the batter into balls the size of a small apple, and drop carefully into the hot oil. Fry the oliebollen in small batches until golden brown, about 8 minutes, then lift out with a slotted spoon and drain on absorbent paper.